Pacific Bluefin tuna caught off the coast of California have been found to have radioactive contamination from last year's Fukushima nuclear accident. "It's a lesson to us in how interconnected eco-regions can be, even when they may be separated by thousands of miles," Nicholas Fisher, a professor of marine sciences at Stony Brook University, New York, told BBC News. Fisher and colleagues report their study in the journal Proceedings of the National Academy of Sciences . They examined the muscle tissues of 15 Bluefin tuna ( Thunnus orientalis) taken from waters off San Diego in August 2011, just a few months after the accident at the Fukushima Daiichi nuclear plant. These were animals whose parents would have spawned in Japanese waters and spent one to two years locally before heading to feeding grounds in the eastern Pacific. Media captionProfessor Nicholas Fisher was 'stunned' to find the radioactive signal in bluefin tuna. All the fish examined in the study showed elevated levels of radioactive caesium - the isotopes 134 and 137. Caesium-137 is present in seawater anyway as a result of the fallout from atomic weapons testing, but the short, two-year half-life of caesium-134 means the contamination can be tied directly to Fukushima. There is no other explanation for the isotope's presence. The measured concentrations were about 10 times the total caesium radioactivity seen in tuna specimens taken from before the accident. As a control, the team also examined Yellowfin tuna, which are largely residential in the eastern Pacific. These animals showed no difference in their pre- or post-Fukushima concentrations. The research is likely to get attention because Bluefin tuna is an iconic species and a highly valuable fishery - thousands of tonnes are landed annually. But consumers should have no health concerns about eating California-caught tuna from last year, the team says. The levels of radioactivity are well within permitted limits, and below those from other radioisotopes that occur naturally in the environment, such as potassium-40. "The potassium was about 30 times higher than the combined radio-caesium levels. If you calculate how much additional radioactivity there is in the Pacific Bluefin tuna caught in California relative to the natural background - it's about 3%," said Prof Fisher. The scientists even calculated how much radioactivity might have been present in the fish before they swam across the Pacific (it would have fallen over time) and figured it could have been 50% above background levels; but, again, this would still have met the legal requirements for safe consumption. Tuna caught in the coming months will be subjected to new tests. These animals would have spent much longer in Japanese waters and so conceivably could have a very different pollution load. 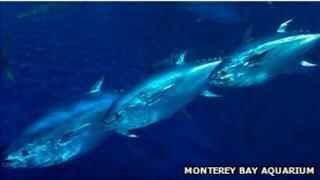 The team also believes the investigation should be extended to other migratory species that frequent Japanese waters. Fukushima pollution is potentially a very useful tool to trace the origin and timing of animal movements. Because of their very predictable decay rates, the caesium isotopes and their ratio to each other can be used like a clock to work out when a particular migration took place. "There's been a lot of really nice electronic tagging work, but any tag you put on a fish shows you what that animal will do from this point forward. What it can't tell you is about the past, and that's what these tracers can do," explained the study's lead author Dan Madigan from Stanford University. "The logical next step is to look at other species that do what the Bluefin do… migrate from Japan. "Right now, we have the sampling in place to look at sea turtles, sharks, other fish, potentially whales, and some seabird species as well. This will give us information about the transport [of the contamination] by the animals and it will tell us about the migratory patterns of the animals," he told BBC News.